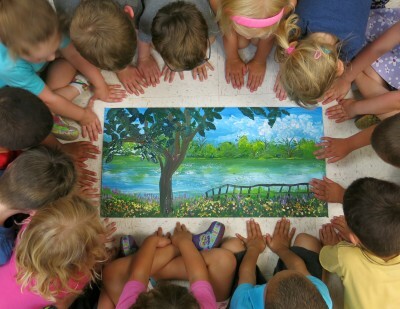 We made an acrylic painting of a park near their school (Olde Isaac Walton Park in Leesburg, VA). What a joy and privilege it was to be asked to lead an afternoon painting workshop for a class of about 15 preschoolers at Leesburg Open Arms Preschool in Leesburg, VA this summer! The image we painted is based on Olde Isaac Walton public park located walking distance from their school. We had a great time learning about different types of brushes and supplies and then each child came up one at a time to add a different part of the painting. Here we are celebrating all the hands that painted this collaborative work of art! 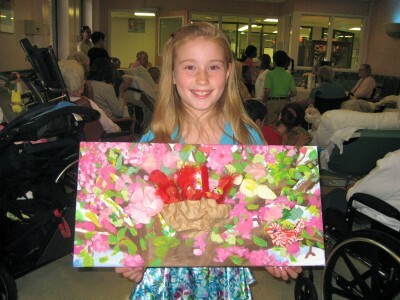 This is one of the eight funny, multi-media collage paintings we made for local nursing home residents. The painting at left is one of six panels that are a part of this project which began in June 2009. Nearly 30 people contributed their talent and love to offer a tangible gift of love to shut-in residents in our community. Children of all ages, my art therapy clients (senior adults with mobility, sight and memory impairments at the Loudoun County Adult Day Center), as well as visitors to my home studio, participated with me. It took us three months to complete. I hope you’ll take a moment to see the full project. It’s sure to warm your heart! Displayed at Loudoun Nursing & Rehabilitation Center in Leesburg, VA and then at Blue Ridge Hospice in Winchester, VA.
Five of my art students (ages 6-9) worked collaboratively with me in 2008 to create a house portrait for a local transitional shelter for homeless women with very young children. This slide show features the work of students in my Budding Artists class. Each semester we pool together our creativity to bless others in our community through an “Art to Heart” project using our skills as artists. During our spring 2008 semester, we decided that we wanted to do something for homeless families in our local area. We decided to do a house portrait for the residents staying at Mary’s House of Hope, a transitional shelter for moms with very young children in Loudoun County. We combined soft pastels, oil pastels and markers with hearts of joy and love to create this one-of-a-kind gift of art.